Miller's brigade continues retreating to the west. Both Sheridan and Rosecrans attempt to rally the men, but it is no use. Seeing the and right of his army disintegrating, Rosecrans decides to follow the men to Rossville and try to rally them there. General Alexander McCook left the field when Davis' division fled. 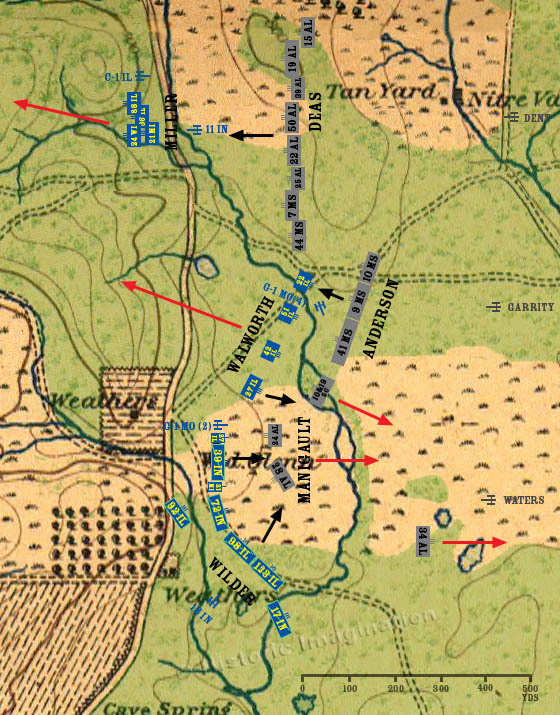 Anderson’s Brigade charges Walworth, and the balance of the Union brigade breaks and flees to the west. The 27th Illinois counterattacks the 10th&19th South Carolina, driving it back. At the Widow Glenn cabin, the 39th Illinois charges Manigault. Wilder’s Lightning Brigade deploys on the run and slams into Manigault’s flank. Manigault’s entire brigade breaks and runs back to the Lafayette Road.